We all know blueberries are good for our health. They contain antioxidants that help protect our bodies from disease and age-related health risks. This super fruit has also gained a reputation for being a top brain food that can boost cognitive function and improve memory, even in old age. Blueberries are vitamin-rich berries that boost brain health via their high content of antioxidants, specifically flavonoids. Daily consumption of this "brain berry" has been found to slow memory impairments and motor coordination that are typically associated with aging. The native North American fruit, whether it's consumed fresh, frozen, canned, or as an extract, can deliver 6 brain benefits, from preventing or treating dementia to improving memory. Our cognitive function tends to decline as we age, but it's better preserved when we follow a diet rich in plant-based foods, like blueberries. In a recent study, researchers found healthy older adults (ages 65 to 77) who drank 30 milliliters of concentrated blueberry juice (the equivalent of 230 grams of berries), had a significant increase in brain activity, blood flow and even memory compared to the placebo group. Flavonoids, abundant in blueberries, are likely to be an important factor in what's causing these effects, which can lower dementia risk. The antioxidants in blueberries can provide a real benefit in improving memory and cognitive function in older adults, and potentially prevent Alzheimer's disease. Alzheimer's is a form of dementia that affects parts of the brain that control thought, memory, and language. A 2016 study found blueberries can effectively treat only those patients who already show signs of mental impairment. Researchers from the University of Cincinnati conducted tests and a brain scan on older adults who were beginning to show signs of mild cognitive impairment — a risk factor for Alzheimer's. The participants were placed into two groups: one group ate a placebo powder once a day for 16 weeks, while the other consumed a freeze-dried blueberry powder (equivalent to a single cup of berries). Adults who ate the blueberry powder showed an improvement in memory and improved access to words and increased activity in the brain. Berry fruits, like blueberries, can help the brain stay healthy via compounds that protect brain cells from free radicals. A 2012 study suggests berry fruits change the way neurons in the brain communicate, therefore, preventing inflammation in the brain that can contribute to neuronal damage and improve both motor control and cognition. The researchers wonder if these benefits are a result of individual compounds shared between berry fruits, or whether the unique combinations of chemicals in each berry fruit have similar effects. Adding blueberries to your diet can increase the birth rate of brain cells in the hippocampus - the brain region responsible for memory — according to a 2002 study by the US Agricultural Research Service (ARS). Aged rats were fed blueberry supplements equal to one cup of blueberries in humans for two months. These rats experienced improved memory performance via the hippocampus, which is one of the few brain areas that continuously replaces neurons. Eating a bowl of blueberries can significantly improve concentration and memory five hours later. A 2009 study conducted at Reading University found participants who drank a blueberry smoothie in the morning did much better at mental tasks in the mid afternoon than those who had a different drink. Those who didn't have a blueberry smoothie saw their performance decline by 15 to 20 percent. British researchers believe the antioxidants in blueberries stimulate the flow of blood and oxygen to the brain, keeping the mind active. Blueberries can deliver a dose of happiness to people who suffer from depression. A 2016 study found eating blueberries can help reduce the genetic and biochemical drivers behind depression and suicidal tendencies linked to post-traumatic stress disorder (PTSD). To investigate what biological factors might contribute to PTSD and its effects, researchers developed a method that induces effects analogous to PTSD in rats, such as exhibiting fear rather than curiosity when presented with an unfamiliar object. This was followed by observing how eating a diet rich in blueberries influences those factors. The researchers noted some of the PTSD-like rats fed blueberries (equivalent to two cups per day) showed a decrease in SKA2 levels — a gene expressed at abnormally low levels in people who have committed suicide — in the blood, and the brain's prefrontal cortex and hippocampus compared to non-PTSD rats. The findings suggest blueberries can have an effect on the expression of this gene. 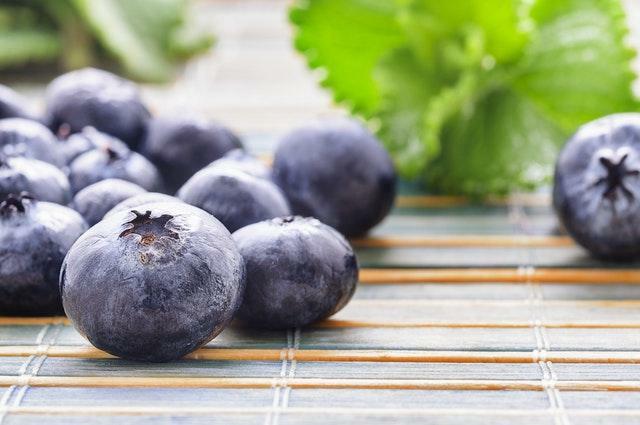 Previous research also supports a blueberry-enriched diet can increase levels of serotonin in the brain, which might help alleviate depression for people with PTSD. Overall, the super fruit can improve mental health. It's important to talk to your doctor before using blueberries as medicine to prevent or treat brain-related health issues.